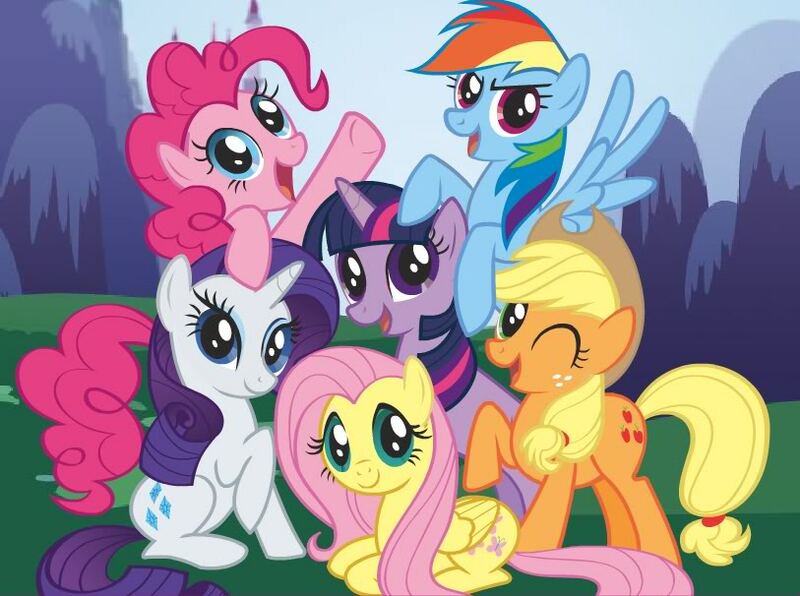 The cast of colorful characters from "My Little Pony: Friendship is Magic." Let me begin this piece with a confession: I was never into the My Little Pony franchise in any way, shape, or form as a child. I didn’t collect the toys or watch any of the cartoons or play games with them at my friends’ houses. If I wanted to collect and watch and play with fictional creatures, 9-year-old me would take Pokémon over ponies any day. Being of the female persuasion, however, I was obligated by society to at least know that My Little Pony existed. Before last year my only two interactions (in the loosest sense of the word) with the franchise were the “Apocalypse Pony” sketch on Robot Chicken and the Nostalgia Chick’s review of My Little Pony: The Movie on ThatGuyWithTheGlasses.com. In late 2010, one of my typical rounds of bouncing aimlessly around the Internet landed me on a certain page of one of my favorite websites, TV Tropes. It was a show page for My Little Pony: Friendship is Magic. I sighed internally. “They made another one? Really?” I thought to myself and, without bothering to read the blurb on the side, departed for websites that made me slightly less worried for the fate of humanity. It wasn’t much later that I discovered a curious phenomenon that, to put it mildly, left me rather perplexed: Friendship is Magic had become popular on the Internet. Very popular. As in, scads-of-fanart-and-macros-and-music-videos-all-over-the-place popular. Then I realized just how many fans this new series had. Male fans. Adult male fans. And from what I could see, they loved Friendship is Magic honestly and un-ironically. Seeing this, I was more than willing to start applauding this magical new show that was getting grown men to throw their hands up in the air and go, “screw you, gender roles! I’m a grown man and I love ponies!” But I still didn’t understand why or how this new iteration of an iconic but bland cash cow was so…good. It wasn’t until one of my best guy-friends started watching it and raving to me about it in person that I finally conceded, “okay, I should probably start watching this show eventually.” Sure enough, one day over summer break I decided that animated ponies would probably be a great antidote to the crushingly dark and depressing current season of Doctor Who and I sat down to watch the first several episodes. Within a week I’d finished the entire first season and had to know when the second one would start. So, with all that said, I still don’t completely understand how this show drew in such an enormous fanbase from the murkiest depths of the Internet (thank you, 4chan) and from far outside its target demographic in general, but I definitely see how Friendship is Magic succeeds at being a genuinely well-made program for kids and parents to watch together. Firstly is the series’ self-aware sense of humor. In other words, it knows that it’s a show about colorful ponies learning lessons about friendship and it isn’t afraid to parody itself on a regular basis. A character randomly bursting into song is likely to be met with blank stares by their peers. The adorable and charming woodland creatures have their limits and will ravage all the vegetation in the town if provoked. The ponies don’t just announce to the audience “what did we learn about friendship today” at the end of each episode, they have to fill out regular reports about it (one episode even revolves around one pony being so afraid of turning in her friendship report late that she goes around causing havoc for her to solve and learn a lesson from, gradually driving herself crazy in the process.) Sometimes they do include an honest musical number that’s meant to be taken seriously, but these are actually well-done and enjoyable songs more often than not. Even so, the ones that fall flat can still be taken as the show having fun and exaggerating itself. Speaking of which, the production values on Friendship is Magic are really spot-on. Many Flash-animated series I see on television irritate me because of how aware I am, just by looking at them, that they were made on a computer. Friendship is Magic manages to overcome this with (literal) flying colors. One of the first things I noticed about the show, even before I started watching it properly, was how in love with the style I was. This was a series that I really enjoyed just looking at. Just Who Are These Ponies, Anyway? Easily Friendship is Magic’s strongest element is its characterization. The focus of the series is the day-to-day escapades of a band of six fillies who become best friends after defeating an evil queen together in the opening two-parter. Still, many episodes focus on just a couple ponies or their interactions with the many members of the supporting cast instead of the “Mane Six” all at once. Most importantly, the group is diverse and each pony has a distinct and detailed personality: Twilight Sparkle, the initial protagonist, is a hard-working student who loves books and studying and is the primary deliverer of friendship-messages in the first season. Applejack, the archetypal cowgirl, is very outgoing and reliable. Rainbow Dash, the star athlete, enjoys competition and can be rather full of herself. Rarity devotes herself wholly to fashion and beauty but always sets aside time for her friends. Fluttershy can be timid with fellow ponies but loves and cares for all wildlife. Pinkie Pie is a hyperactive scatterbrain who will throw a party for any and every occasion. These, of course, are just the Mane Six on the surface and continued watching of the show reveals various levels of depth to each character. These aren’t just ponies who exist in a random town solely for the sake of delivering a plot and then a concluding message. They’re all, for lack of a better word, people. They have hopes, dreams, goals, families, and even jobs. This last item was one of the details that impressed me the most about Friendship is Magic: the fact that the ponies are all active and productive members of society. Twilight Sparkle is basically doing the pony equivalent of study abroad, Applejack works on her family’s apple orchard, Pinkie Pie works at the town bakery, Fluttershy does animal care of all kinds, and Rainbow Dash is always training hard to perfect her flying skills. On that note I want to take this opportunity to pay special attention to Rarity because, out of all the ponies, she was the one who impressed me the most. I went into Friendship is Magic fully expecting her to be the token fashionista and drama queen, and I was both right and wrong. Many other girl-targeted shows I’ve seen with a group of female leads seem to have an unfortunate habit of making sure that no matter how badass the girls are, all of them will still have a fixation on clothes or boys or shopping or some combination thereof. This is not at all the case with Friendship is Magic, but I could see that Rarity was meant to fill that niche single-hooved and minus the badassery. However, the way they handled this was really quite remarkable. Rarity’s key trait is her fashion and design sense, but she’s not someone who goes and maxes out her credit card at the mall every episode and scoffs at other girls for being unfashionable. On the contrary, she’s a shop-owner. She runs her own business, making every dress herself. She enjoys it and is very good at it. Multiple episodes show her rushing around and being unable to hang out with her friends or look after her little sister because she has a large order she needs to complete by the next morning. She goes out of her way to make sure her friends are in good shape. In short, the girl works hard and it’s just so refreshing to see a style-obsessed character express their love in a productive and non-shallow way. Here, in a single episode of a kid’s show, was the very image of one of my biggest insecurities. Too many times in my life I’ve found myself unwilling to perform to the best of my ability for fear of being called a self-absorbed show-off, even when applying for jobs. Sometimes I wonder how I would have thought of myself differently if that episode had been around before that day in 9th grade when my friends told me that they thought I’d changed and become full of myself after winning that special award at Middle School graduation. All I can really say to that at this point is, thank you retroactively, Twilight Sparkle. Maybe I grew up too soon to get that message, but hopefully the next generation of kids will hear it and take it to heart.